I needed to replace my dictionary/thesaurus recently (the kitten destroyed my old one). I was going to just pop onto Amazon and get it but I remembered I had points on my Waterstones card and decided to cash those in. It was only a couple quid and I doubt I’ll add to them in the near future simply because I haven’t shopped in Waterstones for a long time. Each time I go in there for a book I’m finding it very uninspiring. Dictionary aside, I can’t remember the last novel I brought in Waterstones. I think the last comic was the paperback of Civil War 2. One of the reasons I don’t shop there is I never find anything I want to read. The Science Fiction, Horror, and Fantasy sections seem to be being squished into one which is dominated by Fantasy. And most of the books in the horror section are still the heavyweights in the genre, there was a lot of King. Now, don’t get me wrong. Those books deserve to be there. Stephen King is the writer of his generation and one of the all time greats, but there should also be room for other voices in the genre. The person who served me even agreed about how much of the big names were there and that was it. I can’t speak for Science Fiction as I haven’t read any in quite some time and I’ve never been a fantasy reader. I’m also not reading much mainstream fiction at the moment. Most of the books on my to-read list have been books I’ve brought at Horror Cons or from discovering writers via podcasts like Arm Cast and The Horror Show With Brian Keene. Some of the more mainstream ones I’m listening to the audiobooks of anyway. And to be honest, most of the books I’m hearing that appeal to me aren’t in shops, definitely not here in the UK so most of the books I’m buying, outside of cons, are via amazon. You’re not going to get extreme horror, or books by small publishers or indie authors in Waterstones or, well Waterstones is the only real bookseller here in the UK now. We’ve got places like The Works and WH Smiths that sell books in addition to supermarkets but that’s about it. I haven’t wondered around a bookstore in awe for a long time. That excitement of searching for something to pull me into a new universe hasn’t been there for years. I get that buzz from going to the cons and finding books at those to read. That, to me, is where I’m getting the fix I need. Up until recently I’ve rarely seen a horror movie that got under my skin. I say movie because I’ve only started delving into horror novels recently. Aside from being grossed out by the odd scene here and there I’ve never really felt uncomfortable in a way that I now know horror should do. The first I noticed this was last year when I saw The Ritual. This is a film that was based on the novel by Adam Nevill. When I watched that film in the cinema I remember feeling a long way out of my comfort zone, but I still got through it and really enjoyed the movie (I’m looking forward to reading the book itself soon as well). This week I’ve started listening to The Silence by Tim Lebbon. Tim Lebbon is a name I keep seeing pop up, and after meeting him at Bristol horror con last year and hearing him on a couple of podcasts (Three Guys With Beards & The Horror Show With Brian Keene) I knew I needed to check out some of his stuff. At the con I brought off him his book After The War, but knowing what a slow reader I was and that The Silence will be released as a movie sometime this year I believe, I wanted to read that one. So I got it on audiobook and although I’m only half way through it, it’s got under my skin. I thought The Ritual had an unsettling affect on me, but The Silence has gone deep. I almost stopped listening to it a quarter of the way through. It is so carefully crafted to trigger the readers own fears, even to the point where it feels like Lebbon’s written it just for me. Some of the elements here feel personal in a way I’ve not felt from a book before. That’s not to say books haven’t had an effect on me, because they have. Hell, a few have had me chocking up while others I’ve been punching them air in triumph and celebration. As I was listening today I was thinking I’ll be finished it by the time I finished work at 3pm tomorrow, but I had to leave a day between the quarter way point of it and where I got to today, so I might resume it Monday and let the events in it sink in a little. This book is really getting under my skin, and although it’s making me feel this way that’s what I feel is good horror. For horror to really work it has to make you feel how this is feeling. If I had to give this a rating right now it’ll easily be five stars. I don’t have any ideas how this book will end, but I’ll be going in headfirst to find out. I’ve just finished The Warmaster by Dan Abnett and wow! What a book! I loved how Abnett put this together and how it was tied into Salvations Reach (of which I’m glad I listened to immediately before embarking on The Warmaster). I’d guess there’s a lot more connections in the books that have lead up to The Warmaster, but it’s been a few years since I’ve read them. (I’m really hoping they come up on Audible because I really want to read them again, and listening is quicker for me as I can listen while at work). The Warmaster picks up for Gaunt and his Ghosts right after their mission to Salvations Reach, but all is not right with their return. Now, I am a huge fan of this series of books, this being the fourteenth, and I’ve been eagerly anticipating this one since I first heard about it a little while ago. There was a gap of time between Salvations Reach and The Warmaster, but it was worth the wait. Dan Abnett really turns things up to eleven in this book. He pushes characters into places that I wasn’t expecting, but that said I wasn’t really sure what to expect. With the Gaunt’s Ghosts books it feels like each book goes in somewhat of a different direction. This one is no different. A lot of the events in this book I didn’t see coming or where they were going to go. A lot of the characters had their lives turned upside down and Abnett wasn’t scared to kill any of his characters. That is something I learnt a long time ago about Abnett with this series. He is not afraid to kill the most beloved of characters, often in brutal and unfair ways. Even in war where people die for what can be the most silly of reasons, some of the deaths in these books have been a huge kick in the gut. Even when a character doesn’t die, but they are pushed into something harsh and tough to stomach it feels the same as when a loved character dies. That is one of Abnett’s biggest strengths I think. He can write these stories with a huge cast of characters and you either love or hate them, with the odd middle of the road character in between. You get their motivations, you get their mentalities. It all works very well. This book really opened up a whole can of hell yeah! And it puts so much out on the table for future novels that has left me bouncing and determined to re-read the previous books again in the new year. There are many reasons why Dan Abnett is one of my favourite writers, the Gaunt’s Ghosts series is one of them. Beautifully written, to the point where you’re almost there when the las-bolts are flying. If you’ve read these books you’ll know there have been three characters that have left over the years that had nothing to do with dying, although one did eventually die if I remember right, but the two that always sits in my mind when I’m reading these books are Brin Milo and a scout called Mkvenner (I can’t for the life of me remember his first name). Both these characters went off for different reasons. For Milo, he went with Saint Sabbat, and I’ve heard rumours that Abnett has always intended Milo and the Ghosts to get back to each other at some point. With The Warmaster, the Saint is on the same planet as Gaunt and his Ghosts. When I found this out I was waiting for them to come together, but it didn’t happen. I really hope Abnett does so in the next book, because aside from the return of Mkvenner, that is one of the moments in this series of novels that I am eagerly waiting for. I think Dan Abnett is setting up to bring this series to a close, to a point where the Sabbat Worlds Crusade is either won or lost. 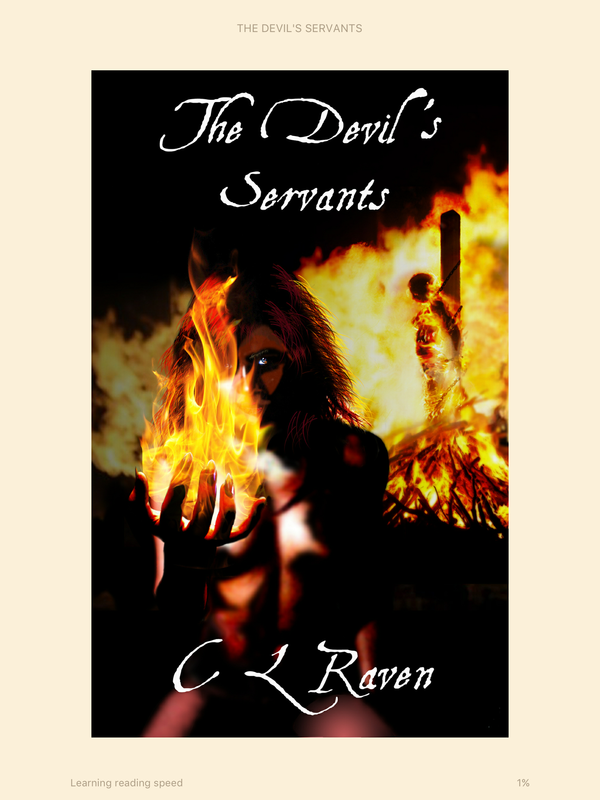 The Devil’s Servants is a story set during the 1649 Edinburgh Witch Trials and tells the story of Nessie and how she gets wrapped up in the trials. Now, I am a big fan of CL Raven. Not only are they great people I LOVE their writing. Their previous release, Silent Dawn, blew me away and I had high expectations for The Devil’s Servants, and I wasn’t disappointed. It’s very easy to feel like you’re in Edinburgh while reading this. CL Raven give just enough to fuel the imagination, I felt like I was there in the graveyard, or the market. Or in Nessie’s room. Especially the Gaol. Cat and Lynx know a lot about the subject of the witch trials from this era, and that came through in the book. Not only is it beautifully written, its gripping. I’m really not a big fan of historic fiction in any form. It’s just not something that catches my attention, The Devil’s Servants really hooked me though. The amount of times I thought I’d only read one chapter and end up reading two or three instead, I can’t even count. With each book, Cat and Lynx Raven are getting stronger and stronger with their writing. I haven’t read all of their work, but each time I read one of their stories I see the strength there is in them. With each new release I see a new strength to their work. One of the elements I loved in Silent Dawn was the relationship between the main three characters. What I love in this book is what Nessie goes through and her whole arc. I felt a lot of her conflict throughout the story and really liked how her story wrapped up. A quick little shout out for the cover(above image) by David V G Davies. It’s awesome! I strongly recommend The Devil’s Servants, it’s a page turner and one that got me interested in a part of history that I’ve never really paid much attention to. Please check it out. Okay, so Savant is the story of Tobe and Metoo, and I don’t really want to say more about the story, simply because I don’t think I can give much of a description of it without giving something away. Savant is a damn good, slow burn, which unravels as the pages pass. I found it to be a page turner which surprised me at how quickly I read it. I am a slow reader but with Savant I zipped through it at quite a lick for me. I think it was three weeks that I smashed through it with the last half of the book in about a week, which is pretty impressive for me. It really pulls you along and it’s easy to read it in small doses and not loose the momentum of the story. The pace of the story is impressive, it never feels like it’s speeding up or slowing down but just leads up to the story’s climax very naturally. There’s no real world building in the story, but everything you need to know is revealed as the story progresses, and revealed at the right time to give the answers needed. The writing is very beautiful and it was easy to picture what was going on while not having too much detail of the surroundings inserted into the text. If you want a book that spoon-feeds you everything, or is action packed, then this isn’t the book for you. If you want something that has depth, a little mystery, varied and engaging characters. A storyline that slowly gains pace to it’s climax, then this book is worth checking out.